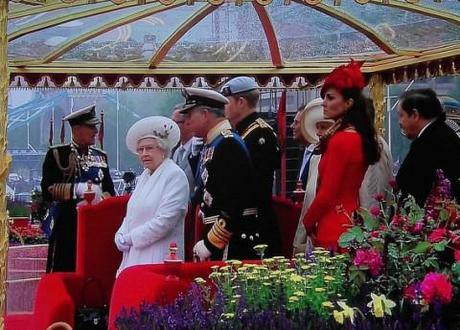 The Queen’s Diamond Jubilee celebrations have come and gone. There was the pageant on the river, which saw over a thousand boats sailing and rowing down it in the rain; there was the concert at Buckingham Palace, and the carriage drive through the City; the thanksgiving service at St Pauls. Whilst the Queen remained stocially celebratory, the Duke of Edinburgh was hospitalised with a bladder infection. So what has Britain made of it all? Are we finally learning to live with ourselves as a post-imperial power? It seems so, with barely a voice of dissent in the commentariat, all of whom agree that the events have made Britain seem a cheerier place once more. “It has touched me deeply to see so many thousands of families, neighbours and friends celebrating together,” said Queen Elizabeth II in a special address to the nation, quoted on the BBC. Some people rose to the occasion, said The Times’ leader. The Archibishop of Canterbury made a pointed sermon in which he reminded us that altruism was what we should be doing. How unlike the BBC’s performance, which treated the Jubilee “as entertainment rather than history in the making.” The whole weekend gave us a chance to see what we “really look like,” said Harry Mount in The Times. We’re “still an island nation,” defined by the rivers and the sea: “Our weather and geology are a second set of parents for us all.” Mount added in another piece on The Telegraph that whilst our architecture was shown off brilliantly, we missed a good bit of “memorable oratory.” Nobody knows how to write good speeches any more, which is a great shame. The Queen is the nation’s Nan – what would we do without her?